After the Charlottesville protests turned deadly, Trump held a series of press conferences where he infamously made statements equating the neo-Nazis and white supremacists with the peaceful protesters, stoking even more anger. During one press briefing in particular, Trump took the occasion to promote one of his company’s products, Trump Wines, which he said were made in a nearby winery in Virginia, that he said was the largest in the state. Trump had said that he owned the winery – and he did buy it in a deal that was a huge bargain – but it is now actually owned and overseen by his son, Eric. That set a journalist from Vanity Fair off on a quest to learn more about Trump Wines and the winery – which he learned wasn’t the largest in Virginia – making about 45,000 cases a year, compared to at least two other area wineries that produce 60,000 cases a year or more. Trump, he reports, has 210 acres while Pindar, on Long Island, New York, has 500 acres and produces almost twice as many cases of wine per year. Then came the big question: how good is the wine produced by Trump Wineries? So the journalist found a world-class wine expert to sample the wines and provide an expert opinion. The first problem was finding the wines. Although Trump had claimed that they were widely distributed, he could only find them available in two places – the Trump hotel in the old post office in Washington and the Trump Grill in Manhattan, in Trump Tower. When they asked for the Trump wines, the server seemed surprised and a little embarrassed, but eventually turned up several choices. First, they tried Trump’s Chardonnay. He also deeded it expensive for what it was – $68 a bottle at the restaurant for the 2015 vintage and $22 a bottle on Trump’s website for the 2016 vintage. His opinion of the 2015 Trump Meritage was even worse. They also tried Trump’s New World Reserve, a more expensive wine made from a similar blend of red grapes grown around Charlottesville. The label said it was “Estate Bottled,” and it sells for $54 a bottle on the website. In the article, the story is told of how John Kluge, once one of the richest men in America (when he owned Metromedia TV and radio companies), bought the estate when he married his wife Patricia, whom he later divorced. She eventually turned to making wine to keep the estate going, bringing in experts to help plant, harvest and make the wine. But it never was as good as hoped, and eventually, she went bankrupt and Trump bought the estate, once valued at $100 million, for a fraction of that by acquiring it in sections until he was the only one who wanted what was left. The message was that the wine was not very good but Eric Trump got credit for keeping the estate and facilities in good condition as they try to improve things. The reality is that Trump Wine is now mostly for tourists and those who want to buy the famous label. When Trump was first elected, there were a lot of buyers, but as the President’s reputation has waned, so have the number of those who seek the wine. 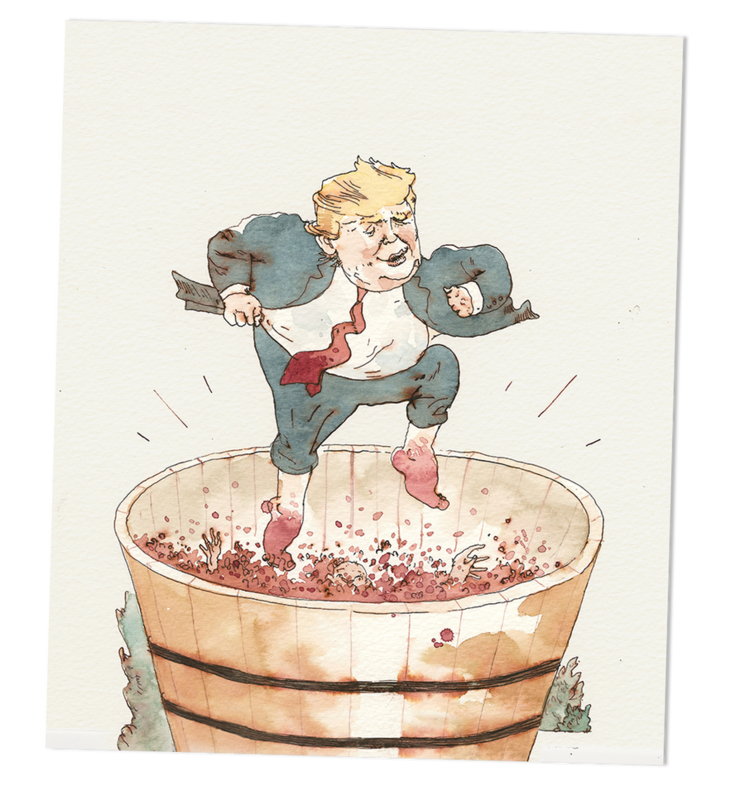 Like so many of Trump’s ventures, his efforts in the wine business are a lot of hype with less than wonderful products and a business that isn’t anywhere as big, as successful or as important as the hype-filled promises that Trump likes to make.